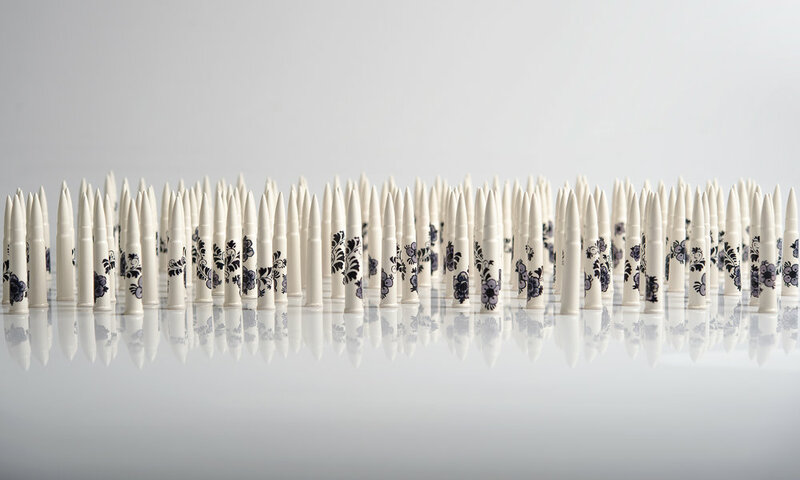 Slipcast earthenware, glaze, custom decals, 500 x .303' bullets, 2016. Five Hundred symbolically represents my Dutch Grandfathers service during the Indonesian War of Independence (1945 – 1949). Directly after serving in WWII, he was one of a small portion of five hundred men initially drafted from Holland to the conflict in Indonesia. 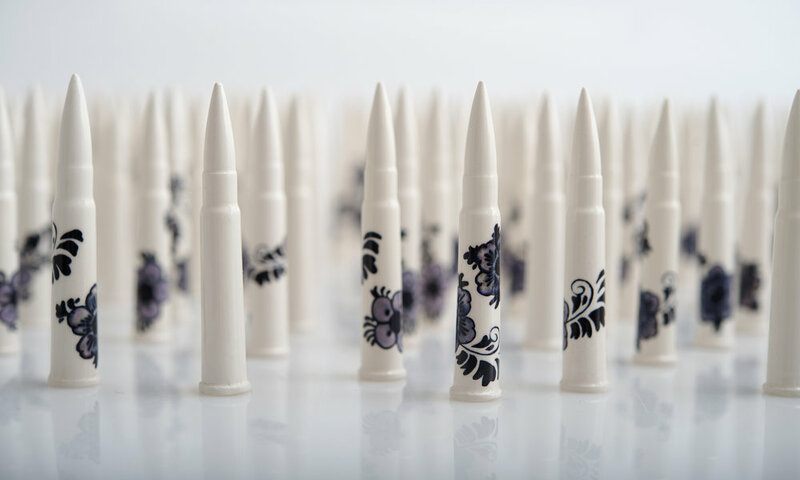 Each of the five hundred bullets are individually made and considerate of a balance between contemporary art practices and traditional methods of art making. The objects are cast from .303 bullets: the standard issue ammunition given to Dutch soldiers during my Grandfathers service in Indonesia. They are also cast using earthenware: the material traditionally used for the creation of Dutch “blue and white” delftware ceramics. The floral design has been produced using photographs of hand painted detailing on original delftware plates acquired by my Grandfather for his military service. My process and materials allow the work, as a whole, to utilize military style uniformity and broad historical relevance, while individually the objects represent notions of violence and fear as well as preciousness and fragility. Five Hundred explores an intentional contradiction between the conceptual basis and historical relevance of the work against its visual appearance. By employing the brutality of military related forms against the delicate nature of the topic itself, I can somewhat communicate the harsh realities of war, as well as the sensitivity of memories related to it. Background photograph by Alec Shultz.